The Hondo by Chrome, which is now a Portland-based company. James Buckroyd is a professional product designer who happens to be addicted to cycling and is always seeking out the perfect route and the perfect piece of gear. He blogs at BuckyRides.com. His last review was the OttoLock. 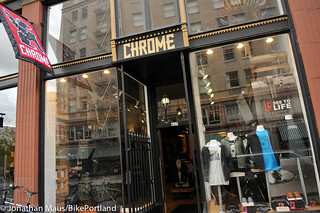 The Chrome retail store at 420 SW 10th Ave in downtown Portland. 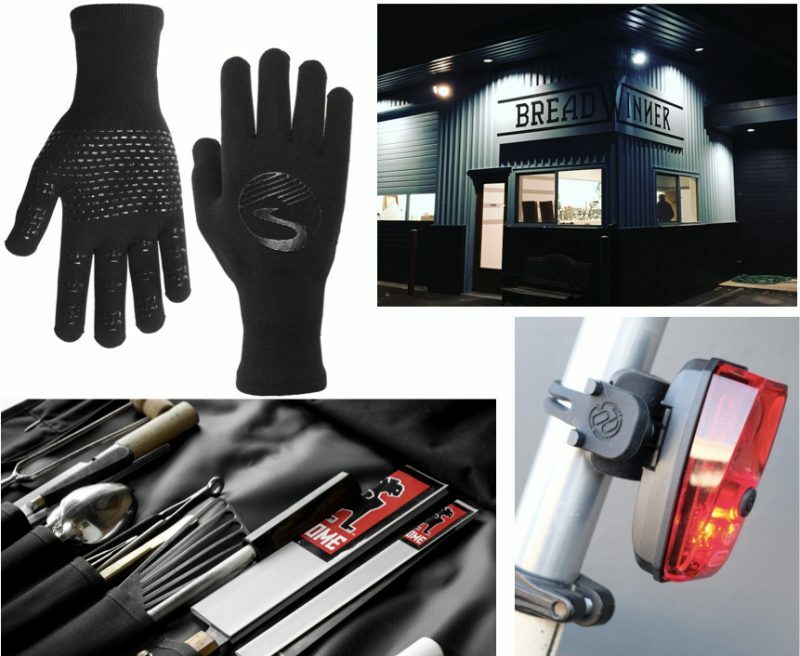 We just gained another iconic cycling brand: Chrome Industries announced this morning that they plan to relocate to Portland in early April. Chrome is well-known in the bike world for its messenger bags, shoes and apparel. Closely tied to the messenger scene since its start in Denver, Colorado in 1995. 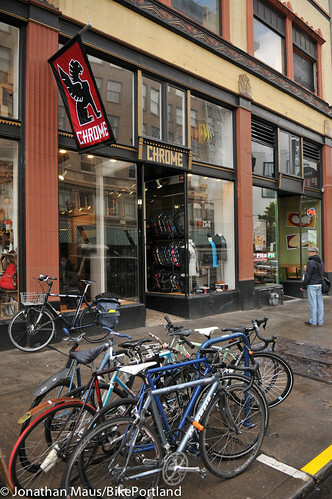 Chrome had been based in San Francisco since 2002 and the company opened a retail store in downtown Portland in 2012. The company makes custom bags in its retail stores and they make about 60 percent of all their products in the USA (bags are made in Chico and apparel is cut and sewn in San Francisco). A rep for the company said there are no immediate plans to bring production jobs to Portland. Greg Doctorelo out on delivery for GO Box. Today is Messenger Appreciation Day, also known by its messenger code name as “10-9 Day.” To mark the occasion the Chrome Hub store in downtown Portland hosted a free breakfast to these unsung heroes of Portland’s economy. In a town where so many people get around by bike or transit, having a good (and waterproof) bag is essential. That’s probably one reason why Chrome opened up a retail store here two years ago (to go along with existing stores in Chicago, New York City, Seattle, and San Francisco (their hometown). 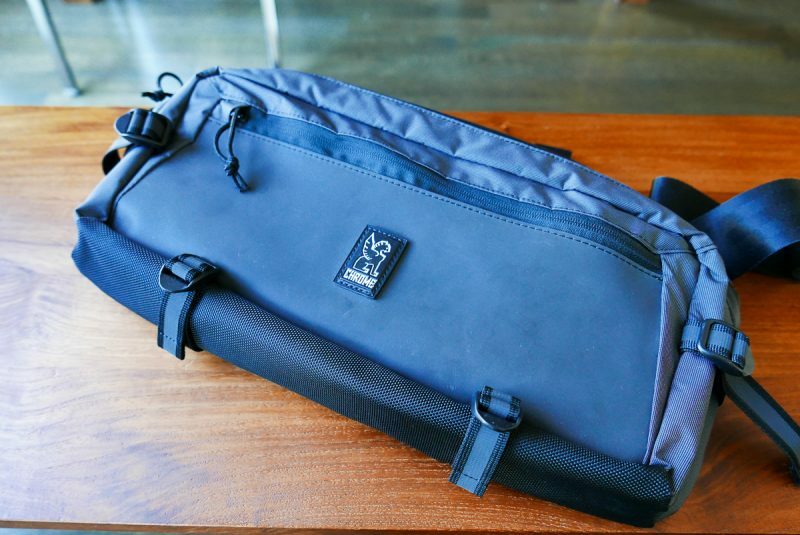 Now the company, known for its iconic messenger bags and roots in courier culture, is touting their ability to offer custom bags sewn and stitched as customers watch. Smashed window at Chrome store. 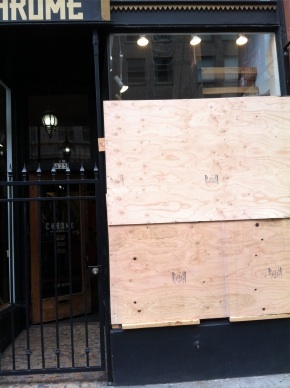 Thieves smashed the large front window of the Chrome Industries store at 425 SW 10th Avenue in Portland in the wee hours of Monday morning. According to Store Manager Lilly Eidsness, they broke the glass and “grabbed whatever they could reach.” In this case that was five bags — which were hand-sewn custom bags made by in-house seamstress Lara Kessler. The total value of all the bags is $630 and the broken window is estimated to cost $1,000 to replace. Chrome is open for business while the window is being replaced. Look what just opened downtown! 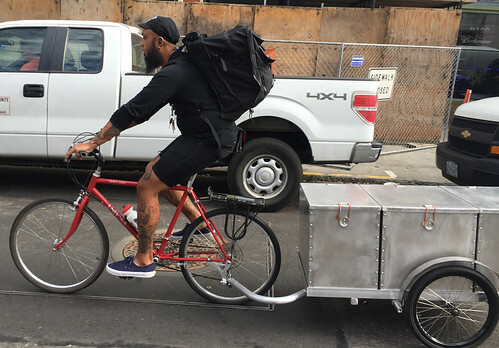 Chrome, a well-known bag and urban bicycling/lifestyle apparel brand, opened a new retail store in downtown Portland yesterday. Staffers from the company’s San Francisco headquarters spent three weeks completely renovating a 1,300 square foot space at 425 SW 10th Avenue (around the corner from the Ace Hotel and up the street from Powell’s). Portland is just the fourth city where Chrome has opened a store, and we’re by far the smallest. Their other stores are in San Francisco (their headquarters), New York City, and Chicago.